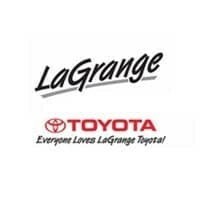 For high-quality brakes and top-notch service, choose the LaGrange Toyota Service Center for superior stopping power. No matter if you’re carrying cargo or passengers, you need the braking confidence that Toyota brakes can provide, but sometimes your brakes will let you know there are issues. A high-pitched squeak when you apply the brakes usually suggests that the brake pad wear indicators are letting you know it’s time to replace them, but a grinding sound means the pads are worn through to the rotor, which might need replacing at that point. Warped rotors will give you a vibration when stopping, and if the brake pedal lowers farther than it should, you could have a leak in your brake system. If you notice any of these issues, bring your vehicle to LaGrange Toyota right away. Our certified Toyota technicians will give your brake system a thorough inspection to find the problem and take care of anything they might find ‐ whether it needs new pads, rotors, drums, or shoes. Between their expertise and our Genuine Toyota parts, your vehicle is in capable hands.